I bought a cardigan in March. Merino wool, long-sleeve, paid 50-ish bucks, but it retailed for $85. (The J. Crew Tippi cardigan, if you care.) I’m considering setting said cardigan aflame. It’s a nice cardigan, sure, but it has not worn well. I’m disinclined to blame the manufacturer, and not just because of my unholy Mickey Drexler fixation. So, what’s so different from me and the intended wearer? Well, for starters, I wore that cardigan to deff. Up to 3x/week, while walking over a mile to the Metro, carting around a 30+lb backpack (what? Wool doesn’t like friction? ), letting my cat climb me like a tree, wading through 90% (rainless! Effing rainless!) humidity, being late to the draw with my umbrella when the bloody rain finally came—the list goes on. I wonder if I should have the same expectations for my clothes and shoes as someone who wears her cardigan once a week, and walks from an air-conditioned car into an air-conditioned office, and back. Mayhap? We’re finally getting to the point: I’ve been reading a lot of vintage style guides lately (post forthcoming, after I bone up on my contemporary style guides so that I can make sure I’m not talking out of my—God, I regret vowing to clean up my blog), and they describe a lifestyle that does not resemble mine. Claire McCardell is really concerned about what I wear to the country club, because that’s where I’ll face some of my harshest critics. Edith Head seems to disapprove of active husband hunting, but is totally willing to roll up her sleeves and help me do what it takes to get a man. (Priorities, people.) Adele Margolis thinks I’m fat. (More on that, later.) None of them think I carry my groceries home on the Metro, or haul enormous stacks of books to my carrel or up hundreds of stairs (inevitably flashing something to someone). Does this lifestyle difference contribute to the expectations that I should have of my clothes? Were things really objectively better back then? I’ve been working on some overlapping posts lately, and can’t seem to land on the order in which they should go. Per usual, I think I’ve overread. I’ll just say: When reading this, perhaps think about how it relates to the evolution of our treatment of style and its cultivation (rather than an evolution of styles themselves), the increasing commercialization of fashion (The Wall Street Journal‘s Teri Agin had written a great book on this, called The End of Fashion: How Marketing Changed the Clothing Industry Forever), image and how our wardrobes affect the ways in which we’re treated, and [prickly prickly prickly] status, and the ever-stickifying interplay between art, money, and social class. I may or may not have a Countess Luann GIF situation all queued up for the status portion. So glad that you asked, Countess. Some Bureau of Labor Statistics daaaaa-taaaaaa! Don’t ever say I don’t do anything nice for you, reader. I made you an infographic, and WordPress won’t let me embed it. Then, I made you a Keynote presentation complete with interactive charts (it was awesome! ), and even though that file extension is accepted media, it’s still a no-go. All right, reader. All right. Then, I made a nifty video. . . . You see where this is going, right? Uphill, both ways. 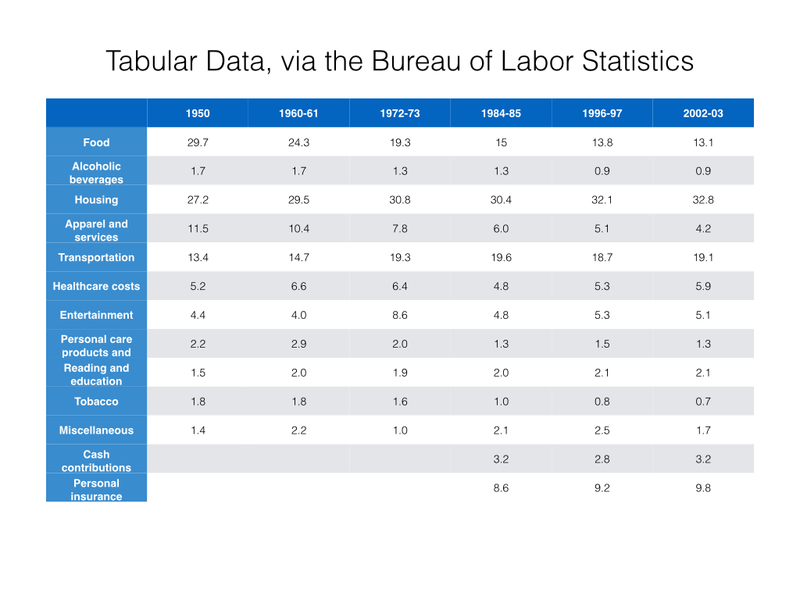 The Bureau of Labor Statistics publishes its Consumer Expenditure Survey every year, now, but until the mid-1970s, it was published whenever they sort of felt like it. At one point, cash contributions and personal insurance weren’t included, and now they are. It’s a hot mess, but I love it. I’m using the data from 1950 to present, because the first half of the century involved two world wars and a depression, market shocks that I don’t think help our cause. After reading Sarai Mitnick’s Coletterie piece “The Decline of Midrange Clothing” and its very, very long comments section, I had some capital-T Thoughts. To my mind, there hasn’t been a decline in midrange, but rather a reconception of what midrange means. I think that consumer expectations of per-garment cost have gone way down, people now expect to own more articles of clothing, and few consumers expect to pay full price for anything. There is a reason why Ann Taylor and J. Crew so frequently do store-wide markdowns. It’s become less about getting a deal, or even thinking you’ve gotten a deal, than it has about feeling you’ve gotten a deal. Let’s see how my hypotheses hold up, shall we? I’ve done some informal surveying of my older professors, and to their memories, there was literally Sears and Penneys, high-end department stores, and couture. Sure, Marshall Field had his basement, but it was a home for in-house knockings off of the stuff from the upper floors. Our question then becomes, are we dealing with a rise of the bottom, or a decline of the middle? No one considered Sears and Penneys to be on the lower end of the spectrum, though. Most middle-class families shopped there, for one reason or the next, and if you were less fortunate, you’d buy fewer things. Also worth noting is that there weren’t really sales that often. One professor says that he only remembers there being a 26 December get-rid-of-all-the-crap blowout (his words!) at Field’s, and that the reset of the time sticker price was sticker price. Teri Agin, in the Marshall Field section of her book, notes that it was really in the 1980s that Field’s started running crazy cakes sales. Let’s look at the data. In the charts below, you’ll notice that in 1950, apparel had an 11.5% share of consumer expenditure, but now it hovers just above 4%. Average family sizes have also changed from 3.0 (though some sources say 3.7, I’m sticking with the BLS on this one) to 2.5, and there’s been a rise in dual-income families. Here’s the same story, but on a nifty, partially cut-off table. Only the best for you, reader. So, people expected to spend a larger share of their income on clothing. Bee-eff-dee, Charlotte. Get to the damn point. Fine, reader. What were they buying, really? How much of it were they buying, too? I can’t find any good data on, say, the number of trousers owned by a single household, but damn I wish I could. I will say that it was mildly surprising to read Claire McCardell endorse a focus on quality, rather than quantity, in 1956. I generally think of this argument as a product of the boom-boom eighties, but nope, McCardell thought it applied to America’s nascent middle-class. In her book, McCardell advocates holding out for a $30 sweater, rather than buying some piece of lord-knows-what on sale. $30 in 1955 is supposed to have the same purchasing power as $266.31 in today’s dollars. For that, you could get an Eric Bompard or Brora cashmere sweater at the end-of-season sale. You know what you (probably) couldn’t get? A sweater from Pringle of Scotland, or a cashmere sweater from many of the marquee-name fashion houses. Why not? Well, I’m afraid that inflation doesn’t tell the whole story. I’m sure you know this, but I’ll give you a refresher course. We measure inflation, in real terms, based on the consumer price index. Basically, inflation is the change over time in the amount of money you’d need to buy a basket of goods and services that offers a certain standard of living. The composition of the basket has changed over the years—no iPads in the 1950s, I’m afraid—but the standard of living is supposed to smooth out. The BLS has a nifty tool where you can isolate different segments of the CPI basket, and chart their inflation independent of the whole shebang. I downloaded the data for apparel, then the data for the whole basket, and used my good friends Excel and Keynote to make you this fly-as-all-get-out chart. The whole basket is in green, the apparel portion of it is in blue. One of these things is not like the other. So, the years 1982-1984 = 100, and are our base years, and what we’re doing is looking at the relationships between apparel and general, relative to the base years. Our answers lie in the rates of change, basically. It doesn’t matter how much purchasing power you have, if you’re not going to spend it. Also, relative prices change. I remember reading that compared to Americans of 1895, contemporary consumers are 60 times richer in mirrors, but 10% poorer in fine silverware, partially because demand for the latter has gone down precipitously and prices have gone up. * (Not necessarily in that order.) It seems we’re richer in clothes, when looking at the graph. You’d only need 25% more money to buy the 1982-84 apparel portion of the basket, versus needing over 120% more money to buy the whole basket. Ruh-roh. 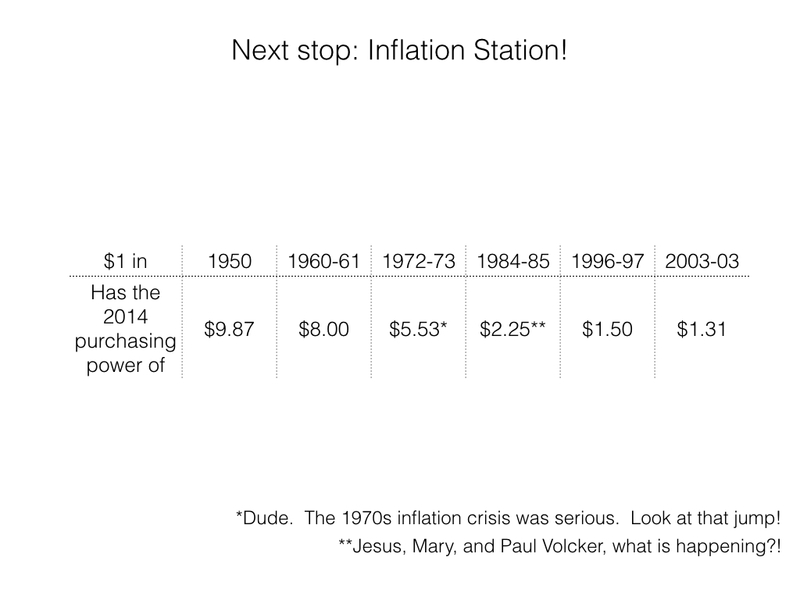 Here’s the evolving price of the dollar, for the curious. Read it as one USD in [blank] would give you the same purchasing power of [blank] in contemporary dollars. One last piece of statistical data before I go grab some pancakes. I was reading the Agin book last night, and she mentions that in 1994, a quilted Chanel bag was priced at $960. Assuming she’s writing about a small, classic flap bag (the one with the interlocked-C lock and the metal-and-leather chain), that same bag retails for $4200. $4700 after this year’s mandatory Chanel price increase. Reader, America is not projected to have 10% inflation this year, and neither is the Eurozone. There’s something afoot, but we’ll talk more about it when we get to the status piece of the puzzle. Why the protracted lecture? I just wanted to toss this stuff out there before doing my alleged “review” of the McCardell, Head, and Margolis texts, and comparing them to contemporary style guides, because, for me, the econ side of the equation was/is pretty important going in. I’m going to come back and a) catch up on comment replies and b) insert some hyperlinks for the labyrinthine BLS website after I’ve had some breakfast. Oh, and I might even proofread. *Oh, I read that statistic in Charles Kenny’s Why Global Development Is Succeeding. ** I should probably thank David Sedaris’s Hugh for the title of this blog post. Previous Post i really can turn anything into major life question, reader. I’m going to delurk just to say how much I enjoyed reading this. Wish there was more stuff like this to read around the Internet. I always love when people come out of lurkerdom (lurkerhood?). I’m so glad there’s another person who likes this sort of thing! Mmmmm, graphs. Yummy, yummy graphs. Thanks for posting this – very fascinating read. You’re welcome. I’m so glad that I’m not the only sewer on math/graph island. I excised an entire paragraph about my shoe saga. I sent a pair of Cole Haan flats into the manufacturer to get resoled. They came back gorgeous—leather soles, shoe tree, that special like-new gleam. Twelve wears later, I’ve sprouted another hole. Don’t even get me started on the backs of my shoes, brutal. I’m thinking about becoming the sort of person who has walking shoes and changes into real shoes at school, but I’d feel a bit too much like those 1990s women, wearing bright white high-tops on the subway, and changing into nice shoes once they got to work. A bit much. Everything in the city dies. Modernity, and so on. To be fair, my lug soled leather boots have worn well — even the less rugged wooden/leather-soled boots are good as new after a trip to the cobbler — so maybe it’s just that there’s a right tool for the job, and ballet flats simply aren’t made for pavement pounding. But what are you going to do? I do the sustainability math all the time, but I still feel guilty. Today I bought a skirt from Zara. Navy, full, cotton poplin, could have probably made it, but it’s just not the sort of project that gets me excited. I agonized over it. My running theory is that the more you fret, the more environmentally conscious and therefore friendly your decision is. It’s science, obviously. So, I was flush with Christmas funds last year, and decided to go to Neiman’s to find myself a pair of embarrassingly, ridiculously, exceptionally nice flats. I took one look at the buttery lambskin and careful stitching, though, and knew that even the Lanvin flats that sustain my hopes and dreams would probably die a terrible death in about three months. I guess the solution would be to buy shoes especially designed for walking? Mephistos or Tieks? Maybe something from Camper? I think most walking shoes are, er, less than attractive. Snobbery will kill me, I swear. I’ve been trying to get better about taking my shoes in to get repaired, and I made a big old stack of them to send home to my mother’s shoe guy. She looked at them and said, “Bunny, they’re gone. Let go.” Eventually, repair costs completely eclipse the price of a new pair. God, I hate being principled. Also, I love it when I take my shoes in, and the cobbler looks at me like “WHAT DID YOU DO? WHAT FRESH HELL IS THIS? !” Maybe I’ll just get a sedan chair, and four willing carters. Well, if it helps to explain 1984: I finally graduated from college in 1984 and the economy went to hell. Cause and effect? I like to think that’s why it doesn’t matter that I got an art history degree: I still wouldn’t have had a real paying job. I really truly love this post. I love where this is going. I hope those pancakes are really good, because you will need all your energy to keep this up. And I really look forward to more. 1984, man. Orwell was right. There are, I think, a dozen art history majors at my school, or some equally absurd number like that. It’s a brave major, I think. You have no idea how relieved I am that people like this. I always assume that when I talk about fashion to my econ professors or econ with my fashion sewing friends, that I’m going to get blank stares. Thanks! I’m trying to convince the owner of my local breakfast place to come hang out in my kitchen, and leave behind some blueberry buckwheat pancakes and bacon brick sandwiches (bacon, potatoes, fried egg, fresh cheddar, butter, baked-that-morning roll). Really, he’d basically be my research assistant at that point, plus he’d be doing us all a service. Did you ever fill us in on the parsnip cake verdict? It looked marvelous. The parsnip cake was an absolute winner – the opinion of all who had a piece, anyway. He took it to work, so I never got to try! Although I see two people have since baked parsnip cakes for their loved ones, so clearly the humble parsnip is making a comeback. Damn girl, you smart… When reading vintage dressing advice I’m always torn between laughing out loud, fantasizing about having 3 hours daily dedicated to my prettiness and throwing up… There is something to be said about the place of women in the society of the 50’s that dressing codes were part of enforcing! Speaking of begin torn between laughter, primping, and vomiting: You know what book is kind of my favorite thing ever? The Karl Lagerfeld Diet. Uncle Karl unabashedly thinks I’m fat, and recommends that I eat 600 calories/day and avoid all exercise to remedy the situation. Haaarrrr. The relationship between styles of dress and expectation is so revealing. Especially given how many designers were men. Dior, Givenchy, etc. It seems that all of the women designers were credited with liberating us, McCardell with the monastic dress, that deplorable Coco Chanel with her tweeds. A vestige of this thinking, of course, is that often contemporary women have to make a forced trade-off between looking as if they put effort into their appearance and being taken seriously, with little consideration of whether the actual relationship between appearance and performance. I’ll write more on that later, though. Gah..I have so much to say on this topic… I work in a male-dominated context and I’ve neutralized my look over the years in order to be taken seriously..
I’m writing an entire post about this. I’m an econ major who wears loud floral dresses and is also a member of Club Ferragamo, and it’s ah-mazing what people say to me, out loud, to my face. Even more stunning are the micro reactions that play across people’s faces, like when I have a meeting for my thesis or something. Awesome, Charlotte. When I was in grad school a professor I was working for (and who also seemed to like my work) told me that in his view women couldn’t learn economics on account of their “cognitive dissonance problem.” I could go on about all of the encounters that I had when I was working in an international development context, and then in a diplomatic context. Now I’m middle aged, mean and very good with data and that seems to work a treat. 🙂 Oh and by coincidence I wore a vintage floral silk dress today AND Ferragamo heels. This is a seriously fascinating topic. I, personally, do not understand the economics and inflation rate of fast fashion. I wrote (very briefly)a while back on the relative cost of knitting vs. buying a comparable knitted items, because I grew irritated at the perception that it must be, ultimately cheaper for me to knit my own sweaters/accessories. The truth of the matter is, it’s only cheaper, relatively speaking, if you compare apples to apples. I use fairly high quality yarns- the only manufacturers using materials of comparable content are luxury brand designers, and in that instance, the (blank) I’m knitting is a lot cheaper than it would be to purchase. But, it still costs me the hours of labor I put into it, whereas the manufacturer is producing their product in the same manner as the $20 sweater being sold at Target. So, between the two manufactured goods the disparity of cost is, I guess, explained, by quality of materials used. However, is there an excuse for a jump from $20 at target to $1K, $2k, at Bergdorf’s? The retail material cost to me as a knitter to knit a sweater from inexpensive acrylic yarn (~$11 using Red Heart Super Saver) vs. using a higher end yarn (~$100) increases just under 10x- nowhere near the increase placed on luxury brands. With sewing, I do find one major difference that explains the difference in cost of production between garments of yesteryear and garments today. YARDAGE. Vintage patterns, up to the 1980s, even, require nearly double the amount of fabric than most of the modern patterns being turned out. But, this should be reflected by a trend opposite from the one you’ve detailed here. None of it makes any sense. Today, Low end retailers use as little fabric as possible during the construction of their garments- there is no print matching, they are flimsy, the use of natural fibers is nearly non-existent, etc… With higher end garments produced today, there is often a difference in quality; however, as above, there isn’t enough of a difference in quality to explain the jump in retail price to the customer. I look very forward to learning more about your research into this and similar topics! Ooooh, I love hearing the knitting perspective. Thanks, Michelle! I started knitting a scarf almost two years ago, and I realized that at the rate I was going, I was going to require over $100 worth of (not especially nice, plain old wool) yarn. Oh, and I sucked. That’s probably important to point out. Anyway, when people ask me if I save money because I sew, or tell me to start knitting so that I can avoid shelling out the 2500 bucks for the Loro Piana cardigan of my hopes and dreams? I laugh. I literally just laugh. It just shows the disconnect between consumers and products, nowadays, I guess. Did you read the New York Times blog piece about Chanel jackets a few years ago? The blog writer was trying to pare down, and thought that her Chanel cardigan jacket was a wardrobe essential. This is the Internet, so commenters went nuts. One guy said his grandmother could make the exact same jacket, using the finest materials, for $80. Come on. Part of the price mark-up is brand exclusivity cushioning. (I have actually, honest-to-goodness heard it called this by someone in the industry.) I’m working on a post about this, so you’ve earned yourself an earful. Basically, you want to hold your product just out reach of a certain sort of customer, so that a) it can keep its grip on the public consciousness and b) the brand can maintain its hold on the tippy-top customers. I imagine walking into an upscale mall and seeing every single woman holding an Hermès Kelly would ultimately diminish demand. We don’t just want stuff, we want special stuff; thus, the question becomes, is something special if everyone has one? Even more obnoxiously, is something special if a middle-aged, soft-around-the-middle, mother of four from Omaha who saved up for years could get one? The answer for some people would be no on both counts. This is part of the reasoning, I imagine, behind not retailing online: it’s another barrier between your stuff and a certain slice of the public. You could call, sure, but that’s kind of unromantic, and romance is also why the margins are so high. You don’t buy a Chanel bag, you buy the privilege of owning a Chanel bag, and the privilege of letting everyone else know (enough with the logos, already!) that you have the combination of means and style to lease a small slice of the Chanel legacy. Also, there is a weird, subconscious mental correlation between price and value, even in the face of evidence to the contrary. This can’t go on forever. 10+% price increase, compounded over years and years? We’re going to hit a wall, eventually. I’m not sure if it’s going to be socio-cultural or economic, though. Probably both. Though even without the cushion, I imagine the sweater would still retail somewhere around six or seven hundred dollars, right? I once read that you want a cashmere sweater designed in Italy, but milled and knit in Scotland with wool from China. We’ve got materials and factory labor, sure. Then there’s also the designers, transportation, putting on those enormous, enormous fashion shows, advertising, a cushion for loss protection, and room to show healthy profits to investors so that you can keep on keeping on. But that’s just the wholesale price. Then you have to sell your sweater to retailers, who mark it up by 250%, usually, as they have to do the same kind of accounting all over again, plus build in for these crazy big sales that consumers have come to expect. I’m writing you a book. Don’t get me started on the yardage! When I first started sewing, I only bought vintage patterns, and thought that all dresses required 5 yards of fabric. Yeah, no. I really have to think about this point, though. Part of it is that silhouettes have gotten streamlined, but surely that can’t be all of it. Phew. I’m off to pore through LVMH’s annual earnings reports. You really got me thinking. Me, too! You’re welcome, by the way. Numbers are my favorite. Sewing has really forced me to reassess my priorities. I am still very much an I-want-it-NOW kind of consumer, but now I have to weigh a whole bunch of other factors beyond price and attractiveness. I love getting chart love! I am that jerk who tells the professor “I don’t feel comfortable with so few graphs,” so yay! Then again, my charts are not nearly as nifty as your drawings. What a great post! Thanks to Stef above for introducing me to your blog, as this is exactly the kind of thing I love to read. Incidentally, I’m both an economist (and one who plays with data all day) and a woman who has a pair of sneakers for walking to work and who changes into heels once there. 🙂 Keep it up. PS You’ve hit the nail on the head with a lot of this, of course, and there are many things at play. Some of it is changing tastes, lifestyles, etc; a lot of it is globalization – decreases in transportation costs, etc., making it possible to exploit cheap labour elsewhere. I’m kind of an old-fashioned type and so I credit my mother and her depression-era-raised father for instilling in me a respect for quality and durability.. At the risk of sounding snobby, I have to mention that I wear mostly Italian-made shoes. I’m lucky in that I spend lots of time in Italy as my boyfriend is Italian. There one can still buy well-made shoes with leather soles that last and don’t cost a fortune (I’m hard on my shoes). Of course, one can also buy low-quality shoes made elsewhere there, as in every other developed country, but I digress. Otherwise I buy vintage Ferragamos and fix the soles and heels. 🙂 Look forward to your next post! I kind of want to impolitely interrogate about your job (data all day, you say? ), but I shall instead just say welcome! Thanks. Having come of age in Toronto in the late 1980s, I can relate to the trauma. I live in the much smaller capital of Canada now and so the dress code is significantly more relaxed. Frumpy and relaxed. I walk through parks and treed neighbourhoods or along a canal to my office, hence the sneakers. Oh! I worked in Washington once upon a time, although even thinking back to that time makes me feel very very old. It was my first job out of school and it was 1992. I frequently wore a second hand Christian Dior suit in dusty rose, with a tulip skirt and shoulder pads (of course) that I found in a consignment shop there. I walked to work from a flat on 2nd St NE, own Pennsylvania Avenue…in heels. Charlotte–thanks for sharing all your Thoughts on clothing and consumers but damn you for cleaning up your language, what are the rest of us salty-mouthed women supposed to do??. I grew up in a completely different world, on a farm. So when I hear of a cashmere sweater that doesn’t hold up to the rigor of everyday life, I must recommend that you try Carhartt or Dickies.. Work clothes are designed to work hard for many wears, but then you want style too…your demands are endless! I will say that living in a rural community lessons the strictures on fashion because we already “know” those levels within the community that the city uses to pigeon-hole its people. In my small community, people know my family, my job, level of education, what I buy at the local liquor store (a teacher who drinks?! scandalous!). So, when I enter a larger metropolis, I look at my homemade, hand dyed and thrifted hodgepodge of goodness and realize that I have entered a “pissin match” with an empty bladder. I have no name brands to flash; therefore, I am unworthy. I always enjoy watching and analyzing clothes on others. Why do they wear that? what do they think it says about them? why do they need to say that? Thanks for continuing the conversation about fashion, clothing, and sewing! Angie, we obviously need to have some sort of salty-mouthed convention, at some point. You’re going to absolutely loathe me for saying this: I went to the Dickies website, clicked under women’s, and automatically looked for the dress section. Yeah, so maybe my lifestyle is a bit misaligned with my taste in clothing? Just a hair? A lot of the girls on campus walk around in exercise clothes all day. And I always thought, “Gosh, how clever of them, they’re always ready for the gym! No excuses.” Now I realize that their clothing-clothing must last so much longer, as a result. Geniuses. I love the rural v. urban comparison. The funny thing is, I don’t think you can almost ever really tell who is who in a city, right? At least not with any accuracy. You could totally be Angie So-and-So mysterious foreign superstar with a free spirit and penchant for the homemade and hand-dyed, and no one would bat an eyelash. You’re too cool for the pissin’ match, is what I’m saying. You’re welcome. Thanks for stopping by! I wonder if Dickies has considered some sort of cashmere, officewear line? Thanks for the post, it’s good to step back and think about what’s been going on around me all my life. Interesting about sales beginning in the 80s, I’d believe it, but for me that’s also when I was first aware of what things cost so I just assumed that was how things had always been. I was already aware of the way quality fell off somewhere in that era, continuing through today. For my first office job, I commandeered many of my mother’s old clothes purchased in the late sixties. Lots of skirts and cardigans. They had years of life left in them and held up to treatment similar to what you describe. From the labels they weren’t high end, just items marketed to young adults a a generation before mine. I supplemented with some new RTW but nothing was nearly as sturdy. I noticed the same with thrifted items, if you could find things from before the 80s they would have life left in them, things purchased later had been worn to threads. I suspect the style manuals you’re reading that suggest buying quality just don’t apply anymore. Up to some point in time, garment price really did reflect quality and that typically meant wearable life. Sure there were always luxury goods like cashmere sweaters which require a life of leisure but consumers knew when they were buying extravagance and when they were buying longevity. Today it seems there are still two tiers when shopping but they have nothing to do with garment strength. There is the fast fashion which is intended to be disposable and then there’s the luxury which although may be made from extravagant fabrics often is still very delicate, requiring careful treatment and laundering. Not to mention all the layering needed to create a wearable ensemble. I think this is all the flip side of cheap labor and must correlate directly with manufacturing moving overseas. When labor is expensive no one would pay to have kleenex sewn together and then try to get that to market before it self destructs. But when labor is cheap anything goes. At the low end this becomes “if it wears out just buy another it was cheap” at the high end it’s “can you believe how delicate this is of course it’s expensive.” And the manufactures do become more stingy with materials, both because they can afford to have cheaper goods made up and because that’s the only other way to drive down cost. In the past there have been economical cuts because of war rationing, now it’s just because of the downward pressure in the market. It would be interesting to gauge whether people own more clothing now than in the past. I’d suspect they do just looking at closet sizes. I live in a house built in ’46 post war and each room has one tiny closet. Closet gripes are a frequent topic in the neighborhood. Somehow people lived in these houses without upgrading the closets for something like 50 years, but then at some point it became unbearable. Sewing for myself does seem to help here, I guess I value my time, so I plan garments a little more carefully. The things I sew do get worn and I wouldn’t duplicate what I already have unless it needs to be replaced. I feel like one small closet and a dresser is pretty much what I need. I can only guess that with RTW closets folks accumulate more and hold the bad purchases longer. I do find the shoes thing frustrating, I know they used to last better. Even when I find one that lasts well and I then I finally have to take it in for repair, sometimes the repair wears down more quickly than the original sole. So aggravating, maybe the shoe repair is skimping but probably the small business person has no more control over quality of materials than I have as a consumer. Okay! It’s been more than two weeks, and I own the whole “I am a terrible blogger” thing. I do. Whole-heartedly. I’m loath to blame foreign manufacturing as a whole, and would rather look to fluctuating production costs on several levels (price of raw materials, rental costs, wages, etc.). Actually, I’m running a regression on this this weekend, and will return with the results, so we’ll see. I get so jealous when I go to the Virginia suburbs. Everything is HUGE. I live in an apartment in a converted Victorian townhouse in one of Washington’s older neighborhoods, and my goodness, the difference is stark. I have one closet. Just one. That’s all. I had to buy a chest of drawers from the 1940s, because contemporary ones were just too big for my postage stamp of a bedroom. Even then, I have to devote two drawers to sheets, towels, and apartment miscellany because, again, postage stamp. The shoes! Don’t get me started. I, too, wonder about repair-material quality. Then again, I sent a pair of shoes back to Cole Haan for repair, and they sprung a hole with a dozen wears. This rings true on the kid shopping end, my earliest memories of shopping were Sears/Pennys/Kmart and particularly the Sears catalog where I only looked at the toys in the back. But it was very seasonal shopping as you say. I can believe consumers have become more diverse but I don’t immediately see why the old system lead to less dead stock. At this point it surely feels that discounting is just built into the system, consumers are seeking a bargain but how many items spend anytime at all at full price. The biggest change I feel I see in the merchandise under this system isn’t the construction/amount of sewing but the fabrics. As someone who sews I do feel guilty buying a deeply discounted item that clearly involved a lot of stitching because no matter how much faster industrial techniques are than my own, it’s clear fair wages weren’t paid. But somehow I feel even worse if the garment appears to be in some way disposable because the material quality is so poor. I guess mostly because that means the whole process has to repeat again but also because I can’t imagine spending my time sewing something which will be thrown out whether for pay or hobby. I don’t want to blame everything on foreign manufacturing but it just makes sense to me that if the manufacturer has wages low enough, at some point simplifying garment construction no longer saves much money so the more important way to reduce cost is to skimp on materials. If the wages are the most expensive component then maybe the quality of the materials is more correlated to the amount of stitching that goes into the garment. I don’t have any data to back this up, I’m curious to hear how your experiments pan out. I’m taking an outsourcing and offshoring class this semester, and we talk a lot about the idea of a fair wage and labor pricing across borders, and it is pretty complicated. Also, most factory workers could put together a shirt better, faster than I can, on the first go. (Heck, probably on the fifth go.) For the simple reason that they do it all day. There was a Nick Kristoff op-ed in the Times about how so-called sweat shop jobs are often the way out of desperate, desperate poverty for a lot of people. It’s complicated, isn’t it? What makes a good garment, a good garment? I have some “Made in USA”/”Made in New York” stuff for which I paid a pretty penny and which have uneven hems, compared to a “Made in China” blazer I just bought from Brooks Brothers that is seriously better than anything I could have made for myself. The thing I take comfort in is that there are people like you and me and the rest of sewing blog community who think about this sort of thing, so that it is an informed decision and not a reflex. Must step off my soapbox and into my made-in-China trousers for a dinner thing. I’ve loved hearing your opinions on the reasoning behind the change. This is fantastic. I’m looking forward to reading the rest of the posts. The cost of everything is such a huge factor. Those itty bitty closets you see in older houses (like mine) are not an accident–they were functional because people just didn’t have as many clothes. And of course that changes everything else. We spend much less and own much more–and end up with atrocious labour practices, shady marketing, environmental issues, and poor-quality clothing as a result. Oooh, I just spoke with the econ librarian at school, yesterday evening, and she has introduced me to the wild and wonderful world of the Producer Price Index. So, I am going to be making a nifty chart tracking producer cost-profit-ratios. Get excited. That is very cool. I am excited! No, I didn’t read that one, but I’d be interested if you have a link. I’ve got a robust theory about this, but I’ll save it for two or three posts from now. My blog is one long, pointless, Ken Burns documentary. I love how in-depth and intelligent your posts are. They’re very refreshing! Keep posting, please! Of course I have no hard evidence to back this up, just hearing my mom talk about her past shopping trends. But I do feel that perhaps back in the day people were more drawn to higher quality goods. Was that all that was available at the time? idk. There had to have been some sore of fast fashion equivalent back then, right? My mom grew up in Japan (so maybe there’s also a cultural difference), but she’s talked about always buying nice quality (re: expensive!) shoes and handbags that would last a long time. Although that trend apparently stopped when she moved to the US. She never shopped like that when I was growing up, but by that time there were so many cheap clothing and shoe stores available. I keep a pair of nice heels in my office to change into so they last longer. Also, wearing comfier flats while in transit (whether I’m driving or taking the train/walking) is easier on the feet! The only way I can make sure my shoes last for several years. The fast fashion equivalent was, from what I’ve heard, making your own clothes. Literally banging through a dress on Friday so that you can wear it to a party on Saturday night. I do see vintage home-sewn clothes with effed-up seam finishes, and less-than-awesome stitching. That, and the Sears/Penneys things, actually. I saw a 1960s JC Penney rayon blouse on eBay was ripping at the seams. This is a great post and I can’t wait to read the next posts on this topic. I’m also looking forward to more graphs! What struck me the most in your graph was how the expenditure for food has declined, seeing as my experience is that quality food costs a lot of money and gets more and more expensive. Are we treating our food in the same manner as we are treating our clothes? More quantity, less quality? I was at the market this week, and I realized that I could get two Kit-Kat bars for the price of one organic peach. One. single. peach. One Kit-Kat bar for the price of one conventionally grown peach. I thought chocolate and sugar were luxury imports, but peaches were wholesome domestic goodness? Sigh. Holy smoke, you’re doing a lot of ruminating. Claire McCardell is my personal fashion girl-crush, and her clothes were actually designed to free women from constricting undies so they could move, work and live. She invented or popularized hoodies, ballet flats, knit separates, modern-cut bathing suits etc. You have to look at the history of American women in the 20th century to understand how few opportunities they had, and how career women like McCardell and Edith Head opened doors for the rest of us to walk through. Clothing in general was much better made up until about 15 years ago, and there were two seasons, so you bought things in fall and spring, and got garments that worked together as outfits and wore them over and over. When you wanted to add to things, you could always sew something. The clothes were manufactured by people who knew how to sew, from quality fabrics. There were clothes in several different prices ranges, with Sears and Penneys at the moderate end, local retailers and department stores in the middle, and higher end retailers above that. When manufacturing went off-shore in the 80s, it was the beginning of the end of clothing quality. By the way, I recently posted about attempting to make myself a Chanel 2.55 bag, and it doesn’t look half bad. It looks GREAT. The next post (or post after the next post) is this very informal series is about status, and its role in why we choose what we choose, and I found your observations spot-on. Sewing Tidbits (whose blog is around here somewhere) sent me a link to a journal article that compares the quality of domestic and imported blazers, in the 1980s. I’m not sure if it does a time series analysis, though. In any event, I have to return with their findings, for you. I’m more inclined to blame the quest for inexpensive, untrained labor generally, than I am offshore manufacturing. (Trade nerd, right here.) If only because, if we took the time to give foreign factory employees a modicum of training outside of “here’s how not to feed your hand into the overlocker,” I think we’d see better topstitching, for instance. I wonder, though, what signifies better quality? (Not a rhetorical question, because I’m puzzling over this, myself. Indeed, I went to a vintage store last Friday, and picked up two skirts and two sweaters from the 1950s and 1960s to compare to my contemporary skirts and sweaters in a forthcoming post. Well, a post that’ll come after I claw my way out of my research hole.) Is it pattern-matching, thread and fabric quality, seam finishes, pressing, cut? Those things don’t really seem to depend on where we manufacture, but on what company-determined standards are imposed upon factory workers, right? Or was there a wholesale, damn-it-all-to-hell attitude that came after, say, the big crash in 1987? Exhale. I so appreciate your stopping by, and am thrilled to be introduced to your blog. I’m making my very French jacket right after I finish up my shirtwaist dress for sewing class. The bouclé is so loosely woven, it unravels just a bit more every time I look at it. I sense I’ll be returning to your posts for a little bit of comfort.